Some years ago I had a big aha moment: the realisation that accountability is profoundly relational. The well-known statement “people take responsibility, but are held accountable” only begins to dis-cover the insights of this deep reality. Elliott Jaques — whose writings caused that aha for me — spent over 50 years labouring on a systemic design for effective work environments, which he finally called Requisite Organisation (RO). He was arguably the greatest psychosocial scientist to ever study the world of work. For all that however, he remains largely unknown, and when known generally misunderstood and vilified. Jaques’ collaborators continue to produce significant work. John C. Bryan has written a sublime paper titled “Three-tier Management: A Structure for Trusted Managerial Leadership” based on Jaques’ RO prescriptions. I will largely base this post on Bryan’s inspiring distillation of RO’s deepest relating and relational principles. Bryan submits that the relationship between trust, the quality of managerial leadership, and organisation structure is not well understood. 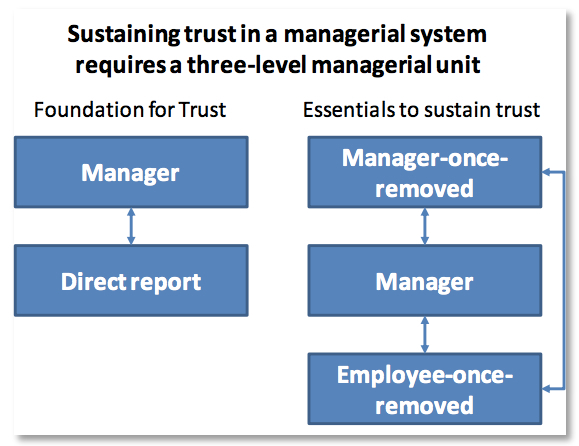 He proposes that trust requires a structure that supports accountable managerial leadership: a three-level unit comprising an employee, the employee’s manager, and the manager’s manager. To achieve operational excellence, organisations must gain employees’ trust and commitment. To merit employees’ trust and commitment, organisations must ensure employees receive competent, effective managerial leadership from an accountable manager. Since managers control the key variables that determine outputs (resources, priorities, task assignments, etc. ), trust and fairness require that they (rather than their direct reports) be held accountable for achieving assigned outputs through efficient use of resources and effective direction and utilisation of their direct reports. Because managers are accountable for the outputs of their direct reports, a manager’s self-interest is in meeting current demand through maximum use of his/her direct report’s abilities. Tasking employees away from current work assignments to develop their capabilities for potential future roles, perhaps in different parts of the organisation, is not in the manager’s self-interest. Therefore, all employees require assurance that someone else is accountable (not HR) for providing development opportunities to help them achieve their potential, as well as for ensuring the quality of managerial support they are receiving. This is the role of the Manage-once-removed. It cannot be delegated or outsourced to HR! A two-level management system risks misplaced priorities, amplified discontent and resentment among employees, competing goals becoming conflicts, loss or neglect of future potential, and not having adequate talent-supply ready when needed. It is also trust destroying. This trust-inducing environment does not just happen! The individual-level analysis occurring in much modern HRM striving, largely misses this with its overly “thin view of mutuality”. Managers need to connect the boxes! Talent management is dead without managerial leadership. This provocative insight is usually met with the managerial response “we don’t have enough time”. The challenge is thus: where do we get more time from? We can’t create time, so we have to find ways of wasting less of it. I have since found two bodies-of-work that usefully address all three opportunities spelt out above. Not surprisingly, these two schools at first appear to contradict one another. After all, the concepts of “hard” and “soft” are opposites…I will explore Elliott Jaques’ “Requisite Organisation” (RO) theory and then Richard Barrett’s work on deliberate culture transformation. How do jobs get “sized” (with no manipulation!)? Elliott’s startling insight was directly inspired by interactions with the union reps. “Bigger” work is fundamentally different because of the longer time-horizons required. His approach requires major adjustment in thinking about organisations. For instance, employees do not report to managers; instead managers are accountable for their subordinates. This shift in power relations means that it is in the manager’s best interest to invest in their subordinates’ success. For those who want an additional, non-abusive approach to “managing” values let’s turn to Barrett. Barrett’s “value-work” was launched when he wrote “Liberating the Corporate Soul”. His culture-transformation tools are now being used globally. What makes the tools powerful, and attractive to CEOs, is that they are a measurement methodology for managing culture change. The Barrett model shows leaders that not all values are of the same type. It is useful to think of them as occurring at different levels of needs and motivations. 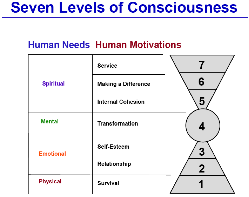 Using Maslow-like triangles, Barrett presents us with Seven Levels of Consciousness. The obvious similarity between this and Jaques’ levels-of-work is that lower levels are concerned with the short-term, while higher levels are long(er)-term in focus. Where they differ, is on how to access the higher levels. Jaques’ model needs the highest levels to be for individuals with the required cognitive capability. Barrett has the highest levels requiring not mental aptitude, but spiritual attunement. By gathering an organisation’s perceptions of what its current and desired sets of values are and then plotting this, deep insights are made. After doing this, it becomes clear what an organisation’s culture is and should be. The amazing result of doing such a values investigation is that desired future state and the implied journey to get there, is generated by the employees in an organization.